End up at the EndUp! This electric SoMa dive bar is known to keep the party going long after other bars have closed for the night. I haven't been in awhile but I'm going back very soon! LOVELOVELOVE this club! Best Dance Club in the CITY! Glitter Ricky plays some excellent techno. I might be biased but its the truth. I am very impressed with this club. I go there for ShangriLa, and the place is packed. The live performance at midnight is always fun. The patio is very big. Have a great time, and definitely coming back. This place rocks when KioKio is in the house. Endup is the place to go to wrap-up a long week of work and a few hours of fun in Castro or SoMa. The DJ and music is always popping, and the drinks are always strong and delicious. Boys are plenty and hot (and sweaty); as they shake their booties on the multiple dance floors. There's always a line after midnight (and even longer after 2am); so if you don't want to wait, get there prior to that and you get in free as well (instead of $20). Only wished they serve alcohol past 2am since the party continue to rock till the late morning! But I suppose we'll have to take on the city's restrictive liquor laws to get that done! On a Sunday evening we hit this place after a late dinner, I think we should have ended here rather than starting. It was getting pretty crowded and it a multi-mixed crowd. Doesn't seem all that gay, no bad vibes. The $15 cover charge was a bit exhorbitant I think but maybe it would have been worth it if we stuck around later. One thing, this place like many other SF dives is very dirty, we sat down at a table that needed some serious cleaning. My buddy got some nasty stuff on the seat of his pants...from the looks of thing I don't think this place has a cleaning staff. The outdoor deck is very large and is a great place to hang...if the place had some good management it could be a decent and fun spot to hang. I have coming to this place for over 17 years and although i'm older I never feel old here. This place is transformative where song and dance trends originate and always the best dj,s in the country believe it or not? Wow, where can you find old black women dancing and young gay men.Truly a place of the soul. On the plus side, great music, diverse crowd, attractive patio, nice dance-floor and the lesbian bartenders mix a potent drink. On the down side, the security are jerks, there are occasional problems with drug O.D. 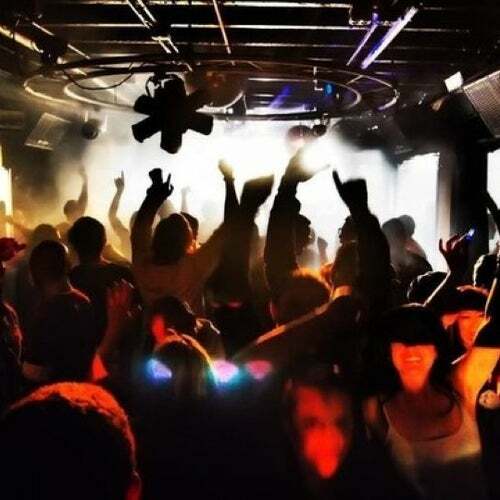 's, the cover charge leans slightly towards expensive, and the crowd (particularly past 2am) can sometimes get crunchy, cranky, weird or a little pretentious. I've had some wonderful dance experiences here and some scandalous times. Fag Fridays, my favorite event here, has recently placed an ad that they will be leaving the End-Up in mid-October 2007. You like to dance? This is the place! My gay and straight friends from all over the globe come here and we all party up a storm. You can go dancing on Sunday afternoon and it feels like a pumped up Saturday night. They have an outside patio with just enough sunlight to remind you it's only 3pm and your working up a sweat on the dance floor. Where else can you party it up with a parking ticket's throw of the San Francisco Courthouse? The crowd is a diverse as a bacterial colony on a week-old doughnut. This is where young gay men came to grow up and grow old. Bring friends only if you're prepared to lose them.